Both my husband and daughter are restless sorts. When our daughter was little and we went to a restaurant, Bill would take her out to run up and down the sidewalk while I paid the bill so she wouldn’t start squirming at the table. Those kids who kick the back of your seat on planes have the same issue. Therapists refer to them as “sensory seeking.” One therapist explained to me that the way I would feel if I sat in a car for ten hours straight is how she feels after sitting for one hour. So we walk to school instead of taking the bus that stops in front of our house, ride our bikes everywhere we can and are mindful that if she gets her antsies out, it’s easier for her to focus. Like me, our daughter is frequently restless and, at the end of the day, often asks for a heavy quilt on her legs or for a deep-muscle massage. She finds it calming in the way I do when a dentist drapes the heavy lead x-ray apron on my chest. The weight soothes me deeply and instantly. I considered looking on ebay for an old lead apron to replicate this feeling, but decided there must be a way to make something similar. I did a quick search for “weighted blanket” and it opened up a new world. Little did I know that weighted blankets and vests are in widespread use as therapeutic devices for children and adults with sensory conditions including ADD and autism. Many cottage industries have sprung up making these blankets. I discovered general directions about making them yourself, so I had to give it a try. I’ve put what I learned into the following illustrated tutorial and downloadable pattern. Thanks to all who helped me by posting their approaches. You should ask your doctor or physical therapist whether to use a weighted blanket, and if so what the best weight is. This pattern is intended to show how to construct such a blanket, not what is the best size or weight for you or your child. The general rule of thumb to determine an appropriate weight for a blanket is 1/10th the child’s body weight plus 1 pound. So a 70-pound child would need a blanket weighing 7+1, or 8 pounds. I’ve read of people filling weighted blankets with everything from rice to beans to sand, but those risk harboring mold. The most practical filling I read about was Fairfield weighted poly pellets, made for dolls and small stuffed animals. ( $6.99 for a 2-pound bag at wards5and10) These can be machine washed and dried on gentle. I used flannel for one side and a smooth cotton batik for the other, giving warm and cool weather options. You can make your blanket any size and weight you want. The downloadable pattern is for an 8-pound, 40” x 52” blanket divided into 4” squares. To determine the amount of filling needed for each square, I divided the weight I wanted (8 pounds, or 128 ounces) by the total number of 4” squares (130.) The amount of filling needed for each square was about 1oz per square. While intended for her, it feels great as a shawl for me too. I sewed the front and back together, and stitched vertical channels 4” apart (this is all detailed on the downloadable pattern at the end.) Using a postal scale, I weighed 1 ounce of pellets in a small cup and put a tape marker at the fill line. If you don’t have a sensitive scale, you could take a little baggie of pellets to your local post office and see if they’ll weigh them for you. 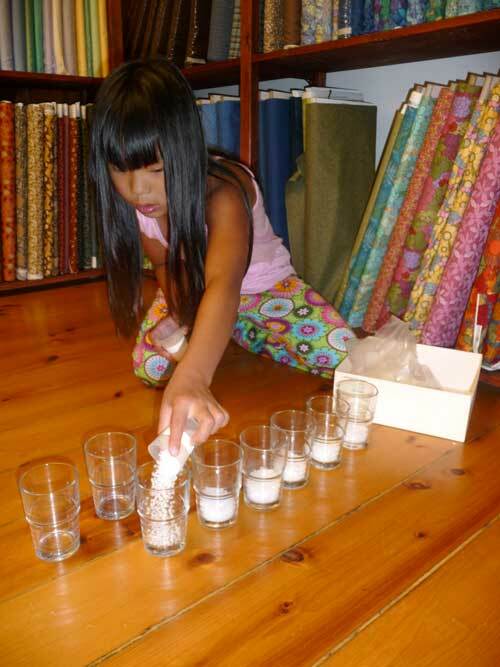 I set out one glass for each of the vertical channels and our daughter had fun filling each with 1 ounce of pellets. She then poured the measured pellets into each of the channels..
After filling each vertical channel, I sewed across horizontally, sealing those pellets into squares. We filled and sewed row after row. It does become a bit cumbersome to sew as it reaches its full weight, as you can imagine from this photo taken at the halfway stage. We kept a broom and dustpan handy for minor spills which were more frequent as it got heavier! Once fully filled, I top stitched the end seam. The downloadable pattern has more details about the measurements and construction. The next morning she carried it down the stairs to the breakfast table and even brings it with her in the car when we have to run long errands. This blanket is so calming to her that we promised we’d make one to keep in the car. Who knew that a few bags of plastic pellets could have such a calming effect? This is so cool, I wonder if one would help me??? Going to try it, seems like since I retired I have what I call restless legs all the time, but especially at night. Wow! I didn’t know this was a common problem. I sleep with many blankets even in the summer and have very restless muscles. I think I might have to try making one of these for myself. Thank you so much for posting about this!! Two sensory people in our house over here! Thank you so much for posting directions on how to do this. Now that the Tongginator is in kindergarten, I may actually attempt this. We need one for her, but the ones you can find on-line are pretty cost-prohibitive. Thanks so much! What a sweet and lovely girl Sophie is…and helpful too. We love our weighted blanket although, can’t sew a stitch so we purchased ours from DreamCatcher Weighted Blankets. The blanket backing is smooth on one side which we didn’t find in other blankets. They have a monthly drawing for a free weighted blanket. You can enter at their website.. it is http://www.weightedblanket.net. I love this! My husband has to have light cover, but I just can not sleep that way. I’m excited about trying this blanket but making it just wide enough for my side of the bed. I’m glad you found a solution for your little one. Thanks! Thank you so much for this tutorial!!! I’m a teacher and I work with children autism. Many of my students have the sensory issues you referred to. I have been looking for a pattern for a weighted lap blanket to no avail. This tutorial is a blessing and just in time for the new school year. Thank you again! THANK YOU!!! Your tutorial is just what I’ve been looking for to help me make a weighted blanket for my nephew. Your directions and photos are great (love the ones of your daughter helping) and your design looks easy and affordable. Your efforts will benefit many people! Thanks again. I’m occupational therapist in Portugal and i think that you had a wonderful idea! I felt proud about you, also as a mother, because you found a way to compensate your daughter needs, alone!!! This means that you really understand her needs. I posted your picture in my young blog, because i’m very “green” in this “crafter world” and i was surprised with the fact of find something that’s related with my job. Now, i invite you to visit my humble blog and to know me a little. I don’t write in english there, but pictures are universal, aren’t they? So, You’ll be very welcome. Wow-this is fantastic! When I was little I used to love sleeping at my grandmother’s becuase she would pile heavy afghans on me until it was hard to move my arms and legs. I loved it! I might have to give this a shot. Thanks so much for sharing! I’ll be linking to this as well. I was always one of those kids that used to pile blankets on the bed and sweat to death in the summer because I needed the weight of the quilts to get me to sleep. I going to have to make one of these. Thanks for sharing!! Hi there! I love this project! I have made a few weighted blankets in my own design (in channels instead of pocket-sized ones, though I love love love the pocket idea) for my daughter as well who has sensory integration disorder and autism. I would love to do a feature of you on my blog. It was recently moved to a new location (http://reclaimingthehome.blogspot.com/), but has been previously active for 2 years as a companion blog to a large message board of homemakers that I run. If you would be interested in doing an interview for a blog feature on the site, facebook, and message board, I would be honored. My email address is homegrownrose@gmail.com. Thank you! I have a 110 pound 19 yo Aspy who needed one of these and we found the price for 20+ pounds of pellets prohibitive. We improvised by sewing 5/8 in channels and filling the channels with marbles from the dollar store. Cost less than $10 for enough marbles for a 45″ by 36″ rectangle. Since it is so heavy and would be difficult to wash, I made “duvet covers” for it in various flannels and nappy fabrics because he likes the feel of those fabrics. Just another option to consider! 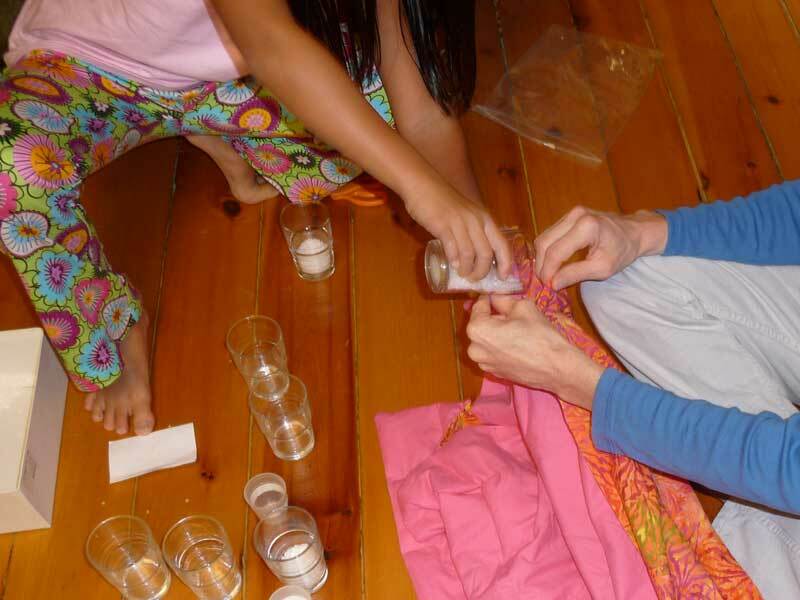 Edie, I love your idea of making it with the marbles and then making Duvet covers for the actual blanket! I may try this idea! Hi — I finished my blanket and posted it on my blog with a link to yours. Thanks again for the instructions! I just discovered this page via StumbleUpon and I had to comment, I always sleep under tons of blankets, as well as three cats! It never occurred to me that the weight is what helps relax me, but it makes perfect sense now! Thanks for the heads-up as well as the lovely tutorial. As a kid, I was afraid of something “getting” me, so I slept under covers at all times. Then, as an adult, I found myself struggling to stay secure while trying not to create a bed-sauna. I worked in a medical office with my x-ray tech mom, and I would borrow her lead aprons to nap with on my lunch breaks. I always ask to keep them on at the dentist, too. I now have a son who will just PILE blankets on at night, no matter the weather, and I will definitely be looking into making one of these for him. Wow! The dentist example hit home for me! I never realized it but I am really relaxed when that put that goofy thing on and I’m always so sad when they take it away… almost empty! Wow, maybe this is why I always want something heavy on my legs at night– I feel very restless without it. i think both me and my kids need these. Thanks for sharing. Thank you for posting this. I am a mental health counselor as well as a sewer! I had never heard of these blankets before and am so glad to know about them! I have to tell you that reading this brought tears to my eyes. You are a super dad and your daughter is so lucky to have a father that will do projects like this with her. I was wondering if this is very hot, since I am not only a restless legs sufferer but also sometimes experience night sweats. I would LOVE to have the additional weight without the additional heat. I can’t “weight” to make one. Thanks for posting this. A few years ago, I made “lap weights” for a classroom with kids that needed to learn to sit quietly and listen. Our sensory challenged students asked for the weights during “circle time”. I made several types, some with stretchy lycra on one side and flannel on the other side. and some with smooth fabric and fuzzy fabric. Not only did the students like the weight, they liked touching and pulling on the fabrics. I just finished making one that is 76″ by 60″ and 21lbs. I love it and even brought it with me when going to a friends to go skiing for the weekend. Just thought everyone would like to know that Michael’s the craft store has them for $7.99 for a 2 pound bag, but then you can get printable coupons for either 40% or 50% off. Either google for printable coupons or check your local paper for coupons which there usually always is. I managed to get all my pellets for around 2 bucks a pound this way. Glad to hear the response from a “grownup”, I was thinking 17lb. (10% of body weight) for my grandson, whose legs hurt after football, would be too much weight. thanks. Awesome instructions! My daughter has some sensory issues and the prices of buying a blanket was just so much so I was thrilled to find your site. Thank you so much for sharing! Thank you SO MUCH for posting this! My 8yo son with sensory issues needs a weighted blanket, and the prices just about popped the eyes right out of my head! I thought I could make one but had absolutely no idea how to do it. A friend and I brainstormed some ideas, but this is so much easier, it’s PERFECT! I can’t wait to try it! This is interesting. I sleep with 3 quilts on my bed for the same reason. Thanks now I know why I love having heavy blankets to sleep with. It explains alot about my childhood! Thank you! I was wondering if I should buy or try to make one of these. My sensory seeking son’s OT recommended one and I just couldn’t justify paying over $100 for a blanket. Now I can make it how he wants it. This would be PERFECT for an autistic child! THANK YOU so much for posting this…we recently found out my son has Sensory Integration Disorder and I love to sew so this is going to be a fun project for him and I….such an easy pattern and the pics were great! This post is awesome! My daughter wasn’t too crazy about the whole blanket, so I modified it and just made a lap pad using the same principle. It’s great! Thanks so much for sharing this. I did find the pellets cheaper by buying in bulk at batt-mart or something like that. I am making it with flannel too, and I hope it works for my daughter with sensory issues. She loves the one at OT, so I am making one for home and school. I can’t wait to get started! Is the weight formula the same for a lap blanket? I am VERY excited to learn about these. I would assume that it would be the same for a lap blanket. We didn’t come up with this formula. We found it on various sites so you might want to Google it to check other people’s experiences. I made a weighted blanked last year for my daughter who has restless leg syndrome. The blanket has helped her tremendously. She has now loaned it to her sister who has the same problem. So it looks like I’ll be making another one. I have checked out many sites for patterns and find this site to have one of the best pattern with the least confusing directions. Thanks so much for posting it and making it available to those of us who need it. Interesting post – while I don’t have a sensory disorder, I have always wanted a heavy blanket on me when I sleep, even in the hot summer months (so it’s a battle between my internal thermostat and my desire for the weight of a blanket). I’m curious – has there ever been any sort of study done on the relation between childhood trauma (such as abuse – physical or sexual) and the desire to have weighted blankets when sleeping? I’d be interested in finding out. I suspect it has more to do with feeling loved than trauma. Remember…in the womb, we are compressed. Swaddled, we are compressed. Hugged, we are compressed. An episode of Grey’s Anatomy mentioned that cows are compressed to calm them before slaughter. It’s neither trauma nor feeling loved. It is a documented sensory need for some, especially those in the Autism community. It has to do with whether a person is sensory-seeking or sensory-avoiding. Sensory seekers enjoy this kind of blanket but those who avoid sensory stimulation very much dislike it. There’s a spectrum of each but if you ask an occupational therapist they will explain that it has nothing to do with being loved or not. We made a weighted blanket for our daughter last year. She is 6 and has ADHD like symptoms – one of the biggest being that she has a REALLY hard time falling asleep. We made an 8 lb blanket with fleece on one side and cotton fabric on the other. She instantly LOVED it and now uses it all the time – from going to bed to simply sitting around watching cartoons. It has literally transformed her bedtime routine. Thanks for sharing a great pattern! As I read about your weighted blankets it reminded me about the woman, Temple Grandin, who had autism and made herself a “sheep squeeze” sort of contraption that she would use when she was overloaded. It worked very effectively for her. I noticed you had many comments regarding autism and asbergers so obviously Temple was really on to something a long time ago. If you haven’t seen the HBO movie about her life I recommend you do. Thanks so much, it was so easy to make! I also put a layer of quilt batting between the two outside layers for more stability. My son has SPD and autism, and thanks to this blanket he’s sleeping all night!!! Thank you so much for sharing this info! My son has sensory processing disorder, and I would like to make him a weighted blanket. Bought the weight pellets today, and was wondering how to construct the blanket. Now I know! I have a pattern there, but it is not nearly as well written and descriptive as yours. Great job! Sorry it has taken so long to respond. You may link to our blog but we’d prefer that you not lift the whole tutorial. We’re glad that you found it helpful. Thank you! I was wanting to make one for my daughter who has a seizure disorder and has major developmental delays. She is a sensory seeker so trying to get her to calm down for therapy sessions can be a challenge. As a mom who loves to craft I knew I could figure out some of the basics of creating a blanket such as this, but your project really lays it all out – including the biggest dilemma – what to fill it with that will hold up in the washing machine (this is for kids after all and we all know they are going to get messy). Thank you! I hope your daughter is still enjoying her blanket. This is amazing! This article and all the comments have been a real epiphany for me. It’s so nice to know that I’m not the only one comforted by the lead blanket used at the dentist. And not the only one that loved to be weighted down by blankets. Stumble Upon brought me here and I’m delighted. I’ll be making one of these blankets for myself. Thank you! Thank you! Thank you for the tips! I’m disabled and suffer from severe, intractable Restless Legs Syndrome and Periodic Limb Movement while awake. Day or night, the moment my brain senses any attempt to rest or sleep, something misfires, triggering what feels like ‘flight’ response. This can last for as long as 8 – 10 hours per night, every night, prior to passing out from sheer exhaustion. As mentioned above, interestingly, I too have had the same comforting experience after a hygienist suggested using the dentist’s x-ray bib to cover my legs during treatment. She told me it had worked well for one of their Parkinson’s patients…and it did. If it’s true that such a blanket will also help with my Serotonin, even better, as all anti-depressants exacerbate RLS/PLMD. I am anxious to make my weighted blanket and see if it works for me. I’ve tried every medicine and trick in the book. It’s so bad that I understand completely why Michael Jackson resorted to such a drastic and dangerous choice of Propofol. I often wish someone could just knock me out….so hoping this works! Thanks again! I have been thinking about making a weighted blanket for my son who has ASD (possibly high-functioning Aspergers) and he seeks heavy weight on him all the time, but I was unable to find good instructions until now. He just picked out his material patterns today at JoAnn Fabrics & they also had the 32 oz (2 lb) poly pellets for $6.99 (so no shipping costs :). Thank you so much for these wonderful instructions!!! I found this tutorial quite a while ago and had sent it to my mother in the hopes she’d take the hint and make me one. She gave it to me at Christmas in 2009 and I absolutely love it. I only sleep without it when I’m in a hotel or at a friend’s house. As a neurotic and nervous person, the blanket (and my nightlights) actually allow me to sleep at nights when I definitely could not before. My grandmother accadentally made a weighted quilt once, out of my dad’s old courderoy and wool pants. We all loved it so much that eventually my mother had to replace the worn-out cotton liner. We still use it, it’s almost 30 years old! my 5 yr old is mildly autistic and uses a weighted blanket at school. i’m going to make him one for home too. thanks for the directions. they do work great. Autistic children to wear at,school,home,trips.For some it is easier to keep on. Thought you might want the info. Johanna – the woman who won the door prize of the Clover Bias Maker…thanks. Wanted to say thanks for the pattern and tutorial. It proved to be very helpful in making my daughter’s blanket. She is now sleeping through the night. I actually took an a premade blanket and cut the hem out. Saved some sewing time and was quite a bit cheaper (remember when sewing was actually cheaper than going and buying clothes?) Now I am on the line to make 2 more for the other kids and I might make one for myself. Thanks again. Your photos and instructions were very fabulous! Thank you for this wonderful pattern. If it weren’t so late and the stores weren’t closed I would begin this now! I am in tears thinking I can make this for my little guy, who is 3 and has SPD, to comfort and help him. Thank you for the pattern! A weighted blanket was suggested to me for my son who has sensory issues–we are in the early stages of diagnosis, but he loves hard hugs and wrapping himself like a burrito in blankets! We went to the fabric store today and he picked out two crazy fabrics and I got the pellets and a very light cotton batting to cushion the blanket. I’m about halfway finished right now and it’s looking great, despite my mediocre sewing skills and crooked lines! I’m liking the extra puff the batting provides, and it makes a nice cushy edge when I sewed an inch border around the whole thing. Can’t wait to let him use it and show it off (I’ve been taking pics of the process)! I googled “how to make a weighted blanket” and your site looked the most interesting!! I am so glad I clicked on the link!!! These instructions are perfect for me! I don’t sew, nor do I have a sewing machine, but I am taking my son out to buy fabric and pellets and we will start working on it! Maybe during the hurricane coming to Jersey this weekend. Thank you so much!!! Six years ago our family started a non profit state certified school for children with autism (clearhorizonsacademy.org in Provo Utah. We are now constructing a school that has ten classrooms. Parents and a 17 year old scout have joined together on an Eagle Scout Project to do 12-15 weighted blankets made from used Levis. We will have these in the school in the quiet (time out) rooms attached to each of 10 classrooms and also in our larger sensory room. Our LDS congregation has adopted our school to help the autism children. This is one of their projects. By the way, my daughter-in-law made me a large full size Levi weighted blanket and I just love it. She has made more which we auction off at our annual school auction. I made this with my mother in law yesterday. While it seemed from the directions easier than another pattern I had found online I think I would have prefered to use the other pattern. It used a piece of muslin that you drew lines on to make a grid of the squares. We found it very difficult to keep straight lines as the balnket got heavier with each row. We did finish and it looks great but it was quite a challenge to sew. Thank you so much for your pattern. My dad and I made an adult sized on this past weekend (40″x75″) and while I originally was shooting for about 15lbs, the finished project ended up closer to 17…and that’s quite alright. I have RLS and have found that the last 4 nights of sleep have been heavenly. I fall asleep faster, sleep sounder and wake up feeling refreshed. It’s been years since I’ve slept this well. I used a 350tc queen sized sheet folded in half as I didn’t want to add much heat with my blanket. I also used the lightest quilt batting I could find for inside and this makes it quilt-like as well as provides softness from the beads. We found that using painters tape (the blue stuff) to make our lines worked wonders in keeping things straight. We also experimented with basting and pinning the heck out of it to keep the beads in place while we sewed the sections closed. Oh, my last tidbit – I bought the poly-pellets in bulk from http://www.craftpellets.com and even with shipping was more cost effective than buying 2lb bags, especially for a quilt of this weight. It’s been 4 days and i can’t imagine sleeping without one. Now I’ve got to make a “travel” sized version that I can get on a plane and in the car! Thank you for this. I made one for my restless boyfriend. I had to make it 16×16 and 19 pounds. When I got to the middle, I started sewing on the floor so the blanket didn’t slip off the table and spill everywhere. We both really like it. I might steal it back from him, haha. call around to plastic companies got 15 pds of poly beads donated from a local company. Just called and got them donated after explaining why i needed them ebay is a good place too. thanks so much for the information and pattern on how to make it. I am glad I found this post! I will be making this very soon for my son with SPD (sensory processing disorder). Thanks so much for sharing!! I sewed a weighted blanket last week using your pdf tutorial. It was very helpful, and the blanket (which can be viewed here: http://www.blogger.com/blogger.g?blogID=2440124774817073264#editor/target=post;postID=3776642332236359894) came out beautifully. Thanks for clear instructions and a great tutorial! I can’t wait to make this. My daughter has difficulty falling asleep… we have tried EVERYTHING, but bedtime is still a battle every night. What a great idea.. thanks for the tutorial! Thank you for this post, I just found it on pinterest. I work with children with autism, and I know that there are a lot of parents looking for instructions like this, so thank you. I will refer them to your site. I completely adore this post! definitely going to need to put this on the list. I am about to make a weighted blanket for my 2.5 year old with special needs. I bought synthetic batting to sandwich the polly pellets, but I just came across your page and I see you didn’t use poly-fill or anything. Are you happy with it? we live in a place that is warm most of the year, so we don’t need any extra warmth, I just want her to sleep through the night, please G-d! Yosefa – Yes we are happy with the weighted blanket without the batting. It’s already very heavy and in the summer it’s unimaginable to have batting in it. It’s sometimes too warm in the summer without the batting so I would not include it. I would also add that it’s worth seeing if your child likes the feel of the dentist’s blanket. Not all kids like it but if they do they will love this. Our daughter is almost 11 and she still uses it especially when she’s overtired or she’s had a lot of stimulation on a particular day. Best Wishes for helping your child get a good night’s sleep so you can get one too. Parents of special needs children are heroes in my eyes. Reblogged this on Txlonestargal's Blog. I work with special needs children, and this will help many of our kids. I can’t wait to make it for them. My friend has a daughter that was recommend that this blanket will help her…and we were thinking of making her one…can’t wait to show my friend and get started. If my weight is 163 what would my amount be for the blanket. Thank you so much for posting this I have been looking at getting a weighted blanket for my cousin with Autism. But they are very expensive, luckily I love to craft so this should be a fun new experiment. I also have a aunt with Parkinsons and my mom has restless leg syndrome so I am existed to make one for them too if this goes well. This may have already been stated, but can this type of blanket be washed in a top loader? Front loader? I have 3 spectrum children and didn’t know how in the world I was going to buy 3 weighted blankets. Thank you so much for sharing your design. Not sure if this design can be washed…check online for the product used to fill the blanket. I have not washed mine…tried to keep it clean as possible. Good luck! Thank you so much for this. How would I find a pattern for a larger-sized blanked, like a queen or a king size? What aboult a weighted vest to bring to school? The schools OT should have them. They know how to size them for the kids. The idealist is often a individual who aids other folks to get prosperous. Hi there, love the pattern and going to attempt to make one for my SPD son. Thanks so much! Because of you I completed a 2lb weighted blanket, 24 individual 4″ squares with 1.3 oz of poly beads in each. Amazed how it came out, this is sort of a car/lap blanket. Next will be a larger version for sleeping. My son already loves it and can’t wait for his bed version. His sister is already angling to get her own as well. One more follow up… What’s your strategy for keeping the poly beads to one side of the 4″ pocket while stitching? Are you putting in a fold and pinning the pocket to keep the beads to the left and the stitch to the right? No, we just smoothed them to one side but do whatever you think will work for you. Thank you so much for the pattern and what the weights are and where to buy. I cannot buy a thunfershirt for my great pyrenees but now I can make one and also I thought of a vest for myself. Or a short scarf? No one iwll know I am wearing my own hug! Thank you again! For PTSD it gives a secure feeling, it helps me stay in the present. I’m not certain why it helps so much but it does. Just wondered about washing and drying instructions. Also my child chews holes in his shirts. Also chewed a hole in feather duvet and pulls the feathers out one by one. (Almost seems calming for him to do this) How easy would it be for him to open up this blanket and swallow these beads? If your child chews holes in anything, I would not use these beads. I would also add that this is a great design opportunity for you to design something that allows him to pull it apart if that’s calming to him. You might think about filling the pockets with something easy to put back into it and making the pockets open so he doesn’t have to chew holes to get them open. Or even some sort of chew toy? But I wouldn’t give him anything that you’re not comfortable ending up in his mouth. Chewing actually is often very calming for people! My little great nephew’s first weighted blanket was quite small because he was small. It was loaned to him by the school that determined he was autistic. He outhgrew it very quickly. My niece asked my help to make a new one since I sew. His birthday was coming up so I found fabric he’d like and set out to the task. Once he had a new blanket of his own his mother returned the borrowed blanket. They were so impressed by his new one that I made another to donate back to the school. They were so appreciative that they sent me a thankyou note. Don’t forget the schools when making these blankets. They have a need for them too. A friend with connections to a local pellet manufacturer even got them to donate enough pellets for each of us to make a blanket. Hers went to her new autistic step-grandson and mine went to the school. Thank you so much for sharing- this is amazing- I love that you can customize this to your own child’s liking. This is really great and I can’t wait to make my daughter one!! We’ve never made a weighted scarf but because it’s going to be smaller and you won’t be able to fit as many beads in, I’d just make it the size you want and fill it up until it feels good to you. These look wonderful! Do you sell these? Love this!!! You mention to ask a Physio about the weight of the blanket, it is actually occupational therapists who are trained in sensory processing issues. In the post we recommended a specific brand Fairfield Poly-Pellets. While we have no relationship with Fairfield, these pellets are designed for use in stuffed animals so we felt they would be the most appropriate for the project as the material, size and the weight were calculated for them. For that reason we’d encourage readers to stick with that brand. I just finished making a weighted blanket for my son. I thought I was going to go insane after trying to put the first row of pellets into the channels because they all stuck to the cotton batting. My genius husband suggested that I use a tube (we used an empty wrapping paper tube) to get the pellets in place and prevent the sticking. It made that step a million times easier, and I was able to finish the blanket in a few hours. Hooray for smart husbands, and hooray for our new weighted blanket! I am an Occupational Therapist and made a weighted blanket for one of the children I work with. It worked so well, my mother started making them to give out to families in the clinic where I work. She has now made 50! Your instructions are the best most concise that I have seen! Would it be OK for our facility to make many copies of your instruction page just as it is to give to people who are interested in making their own or to sewers who are interested in making them for us to give to the kids who need them? I was thinking we could do your page on 1 side and then some tips we have discovered along the way to make it easier to sew across the rows, put in the pellets, etc on the other side. If it is OK, do you want the information updated as funquilts is at the bottom and I see that is no longer your name. Hi Cindy – yes you may use the instructions but please update the name to Modern Quilt Studio. Thanks. I hope you are still receiving these comments so long after the original post but just to say thank you for the PDF. I hope to complete my blanket but using glue for my fabric as I am detained on a mental health ward and therefore can’t access a sewing machine 😊. I have found a pile of blankets about 10-20% of my weight very containing with regards to destructive behaviours and have also slept longer and better of a night. Rather than making a trip to the post office to use their scale, I thought I could use a measuring cup to measure an ounce of the pellets. Any idea how much that would be? An inexpensive food scale works great! I got mine from Bed, Bath, and Beyond. 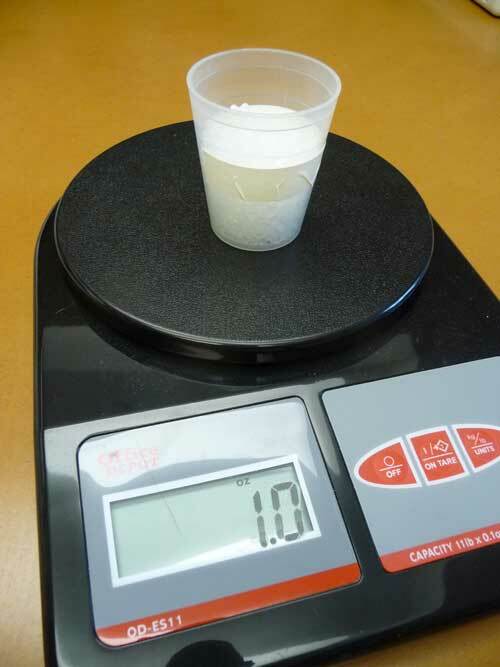 So I guess an ounce would be 31.2ml, 0.128 cups (a little over 1/8 of a cup) or 0.057 of a pint, roughly. Hi. My daughter is spearheading a voluntee project to raise money and make 50 weighted blankets to be distributed throughout the state of Iowa to childen with autism. I was wondering if we have your permission to use your pattern for this project? It is strictly volunteer and charitable, no profit of any sort. Any excess funds will be donated to an autism-related cause. That is fine as long as everyone gets the pattern from the blog and she credits us. We ask that she not distribute it on her own. Thanks. This is also a wonderful idea for the elderly – especially those with dementia. My mom thinks a cat sleeping on her lap. My daughter, who does social work suggested it and my sister made it happen. We made her a weighted lap blanket and sewed her favorite stuffed animal on to it. It has a nice weight and she can pet it, too! I would not use beans or rice to fill the columns of the blanket. I would use poly pellets, you will be able to wash the blanket when needed. Do you have access to a pattern for a child’s weighted vest? Thanks you so much for publishing this pattern. My grandson needed this, and using your pattern made it so simple for me to make an 8 lb blanket. To measure the pellets, I divided a two pound bag into 32 paper cups and found that 1 oz equaled a scant 1/4 measuring cup. To fill the channels, I used a funnel and a 1″ diameter 36″ long cardboard mailing tube that I had saved. It was long enough to reach the bottom of the channels, but you could use a tube from a roll of wrapping paper, a piece of PVC, or a round curtain rod, as long as the diameter will fit into the channels. I had white sheeting material which I used for the blanket itself, then made a duvet-type cover from kid-themed fabric, with Velcro to hold everything in place. I added about 2″ to the top of the blanket to attach the Velcro. This way, the duvet can be washed separately. Since I had over-bought the amount of pellets I needed, I also made mini-blanket he can use as a lap pad. The blanket will be very helpful for this sweet boy, and our whole family thanks you for sharing. Thanks so much for this tutorial. I plan to make one for my PTSD husband (yes, I will adjust the size and weight appropriately!). This is one of the easier patterns I’ve found, and certainly less expensive that the $200+ commercial products! Fits in so easy.! Thanks for your directions! I will pass them on! 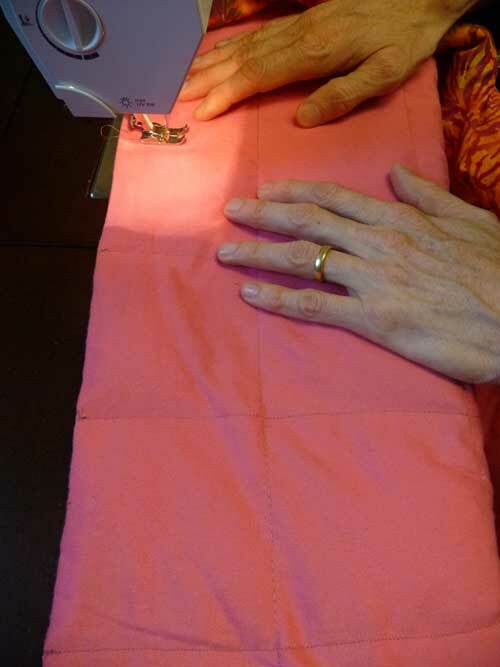 When I made the weighted blankets for two grand kids and my son, i would use the blue painters tape to close the square so that the pellets wouldn’t spill while moving the blanket to the sewing machine. One I was finished with all of the sewing, I carefully removed the blue tape. A friend of mine used the paper medical tape, she said it was easier for her to remove. Hello, I linked this great tutorial to my blog about weighted blankets. Thank you! So, it’s been, what, 8 years since you made the weighted blanket for your daughter. How has the blanket held up over the years? And especially, have you had any problems with the poly beads making their way through the flannel fabrics and spilling or falling out? How well has it washed up? Our daughter no longer felt the need for the weighted blanket when she turned 12 or so. So it was given to the son of a family friend who finds it very comforting still. We had no problems with beads falling out and if washed by hand, in a bathtub for example, it was fine. Can these be put in the drier after being washed for example? A friend asked if I could make a weighted blanket for her daughter who has anxiety. I did, have now made 3 and have orders for a number of others. I grew tired of wayward pellets and constantly having to smooth them back into the pockets while sewing. Instead, I now hand-baste a running stitch while filling each pocket. I fill the pocket, baste just below the actual stitching line, then fill the next pocket, continue the basting stitch across the pocket, and continue the process until that row of pockets is filled (and contained). It’s a little bit of effort that has made the world of difference for me. Just thought I’d share in case it can help others as well. Thank you for the tutorial, it is always nice to have a reference point! I am an occupational therapist in the United States and just a kind comment for your pattern sheet to consider adding “consult your occupational therapist on the use of a weighted blanket” it is my experience as occupational therapists we are treating the sensory processing difficulties and typically the ones to recommend blankets and weighted items for our patients. Thank you for your consideration and again for sharing your pattern! Weighted blankets can be a sore reality for them. However, I really love weighted blankets. This makes things so much more easier for me. Hi All! I recently made a weighted blanket for my adult son who has anxiety issues. It was a big blanket! I used nearly 18 pounds of beads. He is a big boy. He absolutely loves it and said he sleeps so much better with it on. Feels like he’s being hugged. :) He said it gets hot and is not able to use it in the summer time for obvious reasons. Any suggestions on a blanket that can be used in the summer time? What would be a good type of fabric to use that would be somewhat cooler? I too had trouble especially near the end of keeping the beads in the pockets while I was sewing. Seems like the basting idea would work well, but I wondered if anyone had different ideas? I loved a previous idea of using white material for the blanket, then making a duvet. This would help on keeping it clean longer. What do you do when you have to clean the blanket? I saw someone hand washed in their bathtub. Anyone try the washer? How about drying it? Also loved the ideas for filling each section using the wrapping paper tube. Wish I would have seen this earlier! Love these blogs! The comments have been helpful and fun reading! Here’s a new tip that you may like. Instead of using a gift wrap tube for filling columns I had the idea of making a tube with 20 gauge clear vinyl available at Joanns. I cut 10-12 inches of vinyl then make a roll to the desired width and tape alongside to hold. It is much longer and sturdier than cardboard. For the final rolls you can make shorter tubes also! 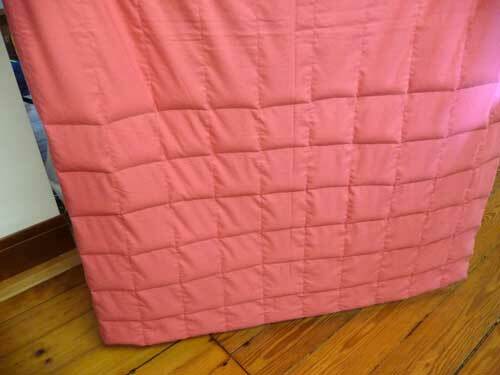 Pingback: 11 Cozy Weighted Blankets DIY Ideas And Projects Lauren J – Hot Pomelo – Internet Portal..
Another option would be to use aquarium rocks for the weight. 20 lbs is around $18.